Published by W.W. Norton & Co.
Green Report Card: Is Your Child's School Flunking the Environment? We all know that the earth is in trouble, but weâ€™re often left scratching our heads over how to change things. How do we avoid poisoning the planet and ourselves with the products we slather on our scalps and squirt onto our floors? And what safe alternatives actually get the job done? 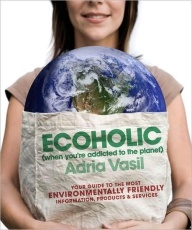 Filled with tips on everything from which seafood is safe to eat to getting the hormone disruptors out of your kids, your carpets, and your love life, Ecoholic is a witty and indispensable guide to the small ecochoices that make the biggest difference.